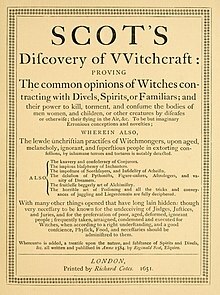 The Discoverie of Witchcraft (1584) is a book by Reginald Scot. It treats witchcraft with skepticism. Scot's purpose in writing the book was to prevent the persecution of the poor, the aged, and the simple for witchcraft. Scot blames the Roman Catholic church for keeping alive the belief in witches. Shakespeare found a description of Puck in the book while he was writing A Midsummer Night's Dream. The book created much controversy. King James I of England believed in witches. He ordered all copies of the book to be burnt. This page was last changed on 4 February 2019, at 18:16.